Aldi special buys are the catalogues which products Aldi offers specially which means you cannot find those products unless you shop for the dates Aldi gives on the catalogues. Aldi Weekly specials are the products which you can shop at only specified dates on the Aldi Catalogues. 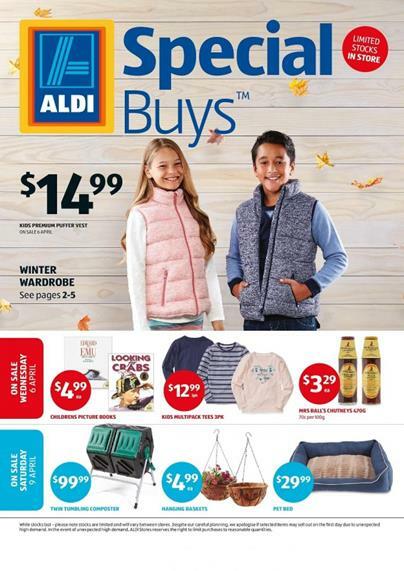 ALDI Catalogue Special Buys Week 14 with the kids clothing for winter. Kids fashion range of ALDI covers the coats, pants, boots, and discounts on the featured catalogue. ALDI also have a kids sleepwear range in special buys. Shop for these products in Wed 6 April. See games for kids, table games, educational toys, and puzzle sets that are on sale on pg 6&7. ALDI catalogue special buys week 14 deals from South Africa food, sauces and spice variety are present with a new recipe of melktert ( Milk tart). Read that recipe and make authentic, good looking, delicious and healthy sweet for your guests. KIDS apparels like embossed jumper, coat, t-shirt dress, puffer vest, jeans for kids and more products have been featured in pg 2-3. Check out prices of boots, kids premium jeans, t-shirt dress and many more products like these. Don't miss out a great sale of the ALDI special buys to save more. KIDS sleepwear for autumn-winter might be interesting for you. To keep your children warm hats, jumpers, pants, tights, leggings for winter, underwear and various colorful tees are featured products of the ALDI Catalogue. You can also see toy sale in the ALDI Catalogue. TOY SALE that must be a selective range for you have been created in this catalogue. ALDI Catalogue offers you way better prices than previous weeks in the entertainment products for kids. Get a look on the toy sale for kids. Educational toys, table games featuring prices of body model kits, science kits, robotic kit, activity kit, puzzle necesets, Children's picture books and more. AFRICAN taste will be in your kitchen. Prepare your meals with the imported African sauces and add some different flavors. Today you can read a new recipe by ALDI. Check out pg 9 for the recipe of melkert that is a healthy and light sweet. Various tools that are necessary for your works while enterting winter are on sale at ALDI Catalogue. Check out a really nice product range by ALDI like flower steps, composter, nozzle set, chainsaw and garden gloves and randomly selected many more deals. DECORATIVE garden products including flower pots, plants and floral sale can be your shopping list items. See savings on the figurines on pg 12. PET essentials on sale, dog food, hairdryer for your dog, mat, towel and so on are available to browse on pg 14-15. In 4th November you can shop special buys like frozen food, seafood, sweets for Christmas and Summer apparels for kids, table games, art tools and books, technology section and many more for the very good prices. Check out these products of ALDI Catalogeu without any difficulty or any problem with using the preview page. Handy use of the preview page will allow you to connect this catalogue fast. I am lucky to see new Christmas decoration because I tried hard to find cheaper ones. No store can offer you such wide range for such prices. Check out pg 6&7 for the Christmas decor sale on 28 October 2015. Christmas toys and figures of Santa are available on pg 8&9. See these and their prices on new catalogue. You will see a new range of products on the latest ALDI Catalogue about the gardening supplies. These are pots for your plants, selection of seedlings, decorative pot, metal planter, hose, watering products, outdoor living products, storage products, cushions for outdoor use, BBQ variety, grocery products, 7 day deals, ALDI grocery and many more. 23 September and 26 September are the dates on which you may shop for these products at the ALDI Stores. These are very useful professionally designed products like Metal Planter that is looking good as well as its use for keeping planting your flowers. Another good looking and useful decorative product is pot on pg 8. Modern fashion of the pots can be addition to your garden with a theme of handmade product even though they are actually not. They look natural, matt and solid. Durable material is used in manufacture of these beautiful pots. A part of the essentials of a inventory of a professional gardener. Telescopic broom for easy, practical and quick cleaning in the smooth surfaces, extra durability, handy and totally exceptional product of the ALDI Special Buys Week 39 Gardening products catalogue on pg 9. Don't miss out this price for that. To see price information please go the catalogue page. Garden bags are other perfection of the ALDI garden range. These are looking good as well as their usefulness. All details of price and availability on PG 9. Various plants are available. Upon your taste you may find this interesting. Check out pg 10 for the details of the price information and availability ON PG 10. Seedlings, microgreens kit, potting mix and fertiliser are also available products on PG 11. New beautiful furniture for your outdoor. This patio range by special buys catalogue will ad a value to your garden. Check out all the details of the price information and variety. Garden bench is one of the products there that is descent comfort in your garden. Set up the perfect comfort in your house. Today you can shop ALDI Special Buys products like furniture for office rooms. Working rooms will meet a vintage fashion of furniture. Electronic assistance in your room will work for smaller amounts than you normally pay to purchase them. It is obviously a great catalogue to accomplish the duty of completing all the necessary things in your bedroom. Living room decoration products like cushions, sheet sets, kitchen appliances, electronic entertainment products and many more numerous items of the ALDI can be yours for the best prices you can get. ALDI is one of the best in this business. LIVING ROOM ACCESSORIES AND FURNITURE featuring a gorgeous looking chair. It is a very good piece of chair made of wooden material and it is perfect with an ottoman. You may purchase this product for only $349 on pg 2. Columbus embellished quilt cover set. One of the most popular and high quality products of ALDI Catalogue Special Buys Week 9 Sep 2015. Go to the page 5 for this beautiful one. Also 4 piece of towels for $26.99 can be yours today. Anika Embellished quilt queen cover set is another set for your bedroom. Upon your choice and taste you can select on of these two. Canvas Wall Arts and other living room decorative accessories on pg 9 creates another way to add beauty to your rooms. 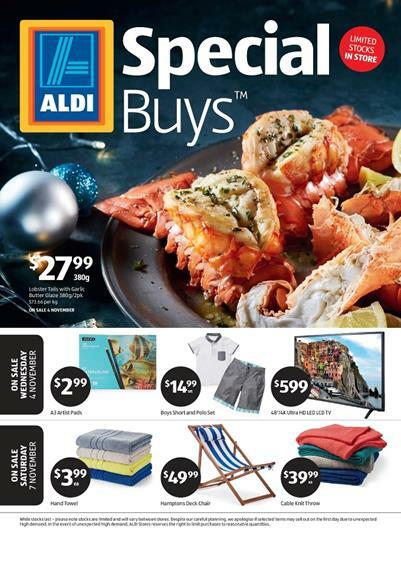 Check out all the things from ALDI Catalogue today for the best prices that will allow you to save more.